← Quest for proof… Cashew nuts in raw-food quality! Enjoy our heavenly raw food recipe. Put the seeds, coconut milk, coconut butter and the agave syrup into a mixing bowl and whisk with an egg whisk until the mixture is smooth with no lumps. Spice with the cinnamon and vanilla. Add the cocoa powder and 2/3 of the Cocoa Nibs. Cover the cream with foil and cool for one hour. 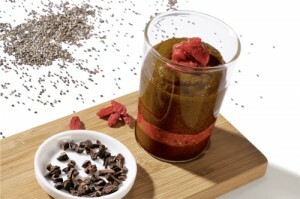 Leave the Goji berries to soak in water for 30 minutes, then strain and squeeze out gently. Keep a few whole berries aside and puree them together with the dates in a mixer, e.g. the Vitamix. First put a layer of the cocoa and Chia seed cream into a serving glass followed by a layer of Goji puree and finally a last layer of the cream. Last but not least decorate with Cocoa Nibs and enjoy your creation.